Whether going to a warming center or piling on the winter clothes, Monday's single-digit temperatures posed a challenge for those who ventured out. This story was reported by Robert Brodsky, Matthew Chayes, Zachary R. Dowdy and Ellen Yan. It was written by Brodsky. If only for a few fleeting moments, Long Islanders found ways to stay warm amid Monday's arctic-like freeze. 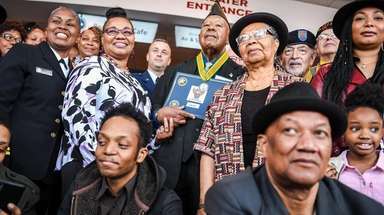 For some, the confluence of the coldest day of the winter with the Martin Luther King Jr. holiday meant a Monday indoors, sipping something warm and binge-watching Netflix to avoid the chill. For others, Monday meant bundling in layers from head to toe with the aim of warding off the sting of single-digit temperatures and whistling winds. They started their cars and trucks remotely — who wouldn't want it warm and cozy inside for the drive? Commuters waiting on a train or a bus impatiently tapped their feet as the unbearable gusts bit any skin left exposed. The frozen air that made mostly sunny skies seem like some sort of cruel joke, courtesy of Mother Nature, turned the task of thawing out into a mostly futile effort. 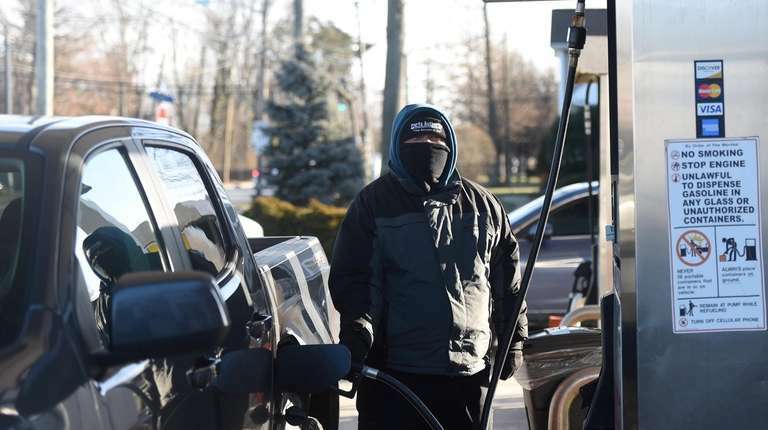 But still, Long Islanders ventured out Monday — for work, to pump gas, entertain the kids home from school, or even, to find a place to get warm — and hoped Tuesday would bring relief. “I’ve been busy nonstop since 6 in the morning." 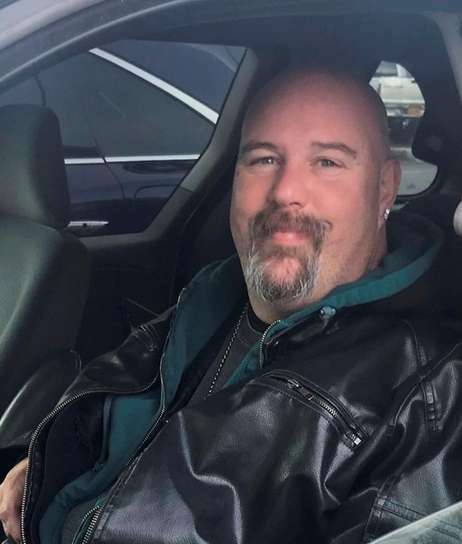 Tow truck driver Danny Colasuonno, 53, of Farmingville, said he spent the day bringing motorists' dead batteries back to life. The biggest issue for him was needing expose his fingers to the elements to use an app to check dead batteries. “I need my fingers free to use the touch screen,” said Colasuonno. The cold snap was good for business for tow truck driver Danny Colasuonno, 53, of Farmingville. His fingertips told another part of the tale as he spent the day bringing motorists' dead batteries back to life. “I’ve been busy nonstop since 6 in the morning,” said Colasuonno, who works for A-1 Car Care of Ronkonkoma. Decked out in a leather vest and leather jacket, hoodie, T-shirt and thermals, Colasuonno's job required exposing his fingers to the elements, even if it only meant tapping an app to check dead batteries. “I need my fingers free to use the touch screen,” said Colasuonno, who had about 10 jobs since getting an early morning start and was en route to another in Lloyd Harbor. 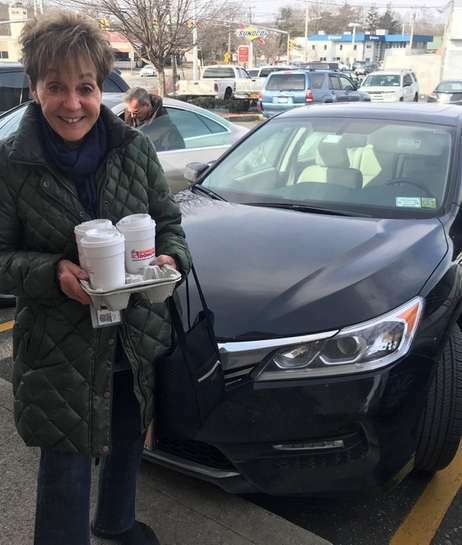 Julie Shapiro, 81, of Melville, is a big fan of Long Island winters and snowstorms, just not getting stranded. Her husband has cancer, and, assuming the predicted rain and ice would eventually mean snow, she wanted a full tank on Monday if she needed to get him to doctor or the hospital, she said. 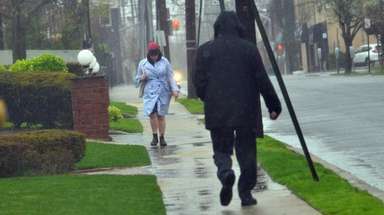 Julie Shapiro, 81, of Melville, heard the forecasts predicting the weekend storm. 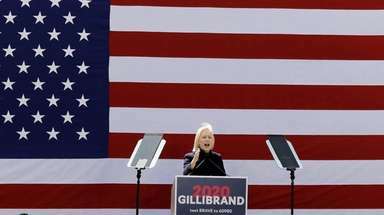 Shapiro said she's big fan of Long Island winters and its requisite snowstorms and shoveling, just not getting stranded without enough gas for her car. Shapiro's husband has cancer, and, assuming the predicted rain and ice would eventually mean snow, she wanted a full tank if she needed to get him to doctor or the hospital, she said. So as Long Island prepared for the storm, Shapiro said she and her husband filled up their Honda Accord and Civic Saturday at a station on Old Country Road. The snow never materialized much and the storm dropped a bit more than an inch of rain across most of Long Island. Sunisa Rung, 43, of Hicksville, said the cold temperature posed a problem Monday. Like most students across Long Island, Rung's children, Pinky, 9, and Annie, 10, were home for the holiday. At about 1:30 p.m., Rung said, she came up with the solution: Hicksville's Cantiague Park Ice Rink. “There was nothing to do and we didn’t want to sit at home all day so we came out here," Rung said. Between 50 and 60 people came to the ice skating rink, said Dan Maricondo, 25, of Hempstead, a rink employee. “It’s like the coldest day of the year thus far and the fact that we can have an ice-skating rink with rooms like this definitely shows that this place was well-designed,” Moricondo said. Some were there for a birthday party but others, like Rung, waited for their children to finish skating from the comfort of the rink's warming room, one of five spread out across Nassau County and opened for anyone to come in from the cold. 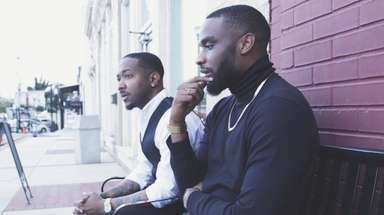 "Right now I'm just taking it day by day." Charles Forrester, 58, took shelter at Hicksville's Cantiague Park Ice Rink warming room. A self-described late-stage homeless alcoholic, Forrester is largely confined to a wheelchair after an auto accident. On most nights, Forrester said he can make do alone but the cold had him seeking help. Not far from Rung, Charles Forrester enjoyed the rink's warming room, complete with a blazing fireplace. For Forrester, the warming room was not just a cold-weather convenience, it meant survival. Frigid winter days have started blending together for Forrester, he said, a blur of booze, nightly hospital visits and the constant frenzy of seeking shelter to rest. 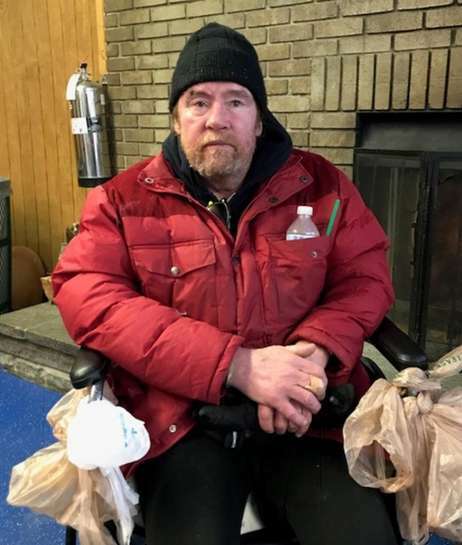 Forrester, 58, a self-described late-stage homeless alcoholic, is largely confined to a wheelchair since an auto accident nearly 36 years ago. On most nights, Forrester said, he can figure out a way to make do alone. Monday's plummeting temperatures, coming a day after the high for much of Long Island inched toward 50 degrees, was different, he said. Forrester knew he needed help and he found it inside a place usually not associated with getting warm, an indoor ice rink. "My feet are frozen and my legs are still cold," Forrester said as he sat near the fireplace. Forrester said he once had a promising career, working for New York City as a union electrical worker. A truck crash on the Tappan Zee Bridge in the summer of 1983 left him with traumatic brain injuries and derailed his plans, he said. Years of pain drove him to drink, Forrester said, often emptying a case of beer or a bottle of vodka every night. As he sipped a large hot coffee Monday morning, Forrester conceded he had no idea where he'd spend Tuesday. "Right now I'm just taking it day by day," he said. For Forrester and other homeless Long Islanders, Monday's single-digit cold can be deadly. 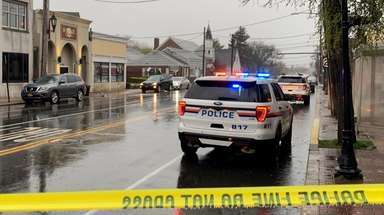 In Glen Cove, city police officers, like they have done for decades, spent the day searching thick woods, stormwater runoff tunnels, under bridges and in parking garage stairwells — places where homeless residents live. If the officers find someone, said Lt. Peter DiMaggio, they take the person to the First Presbyterian Church, which operates a homeless shelter during the coldest months of the year. 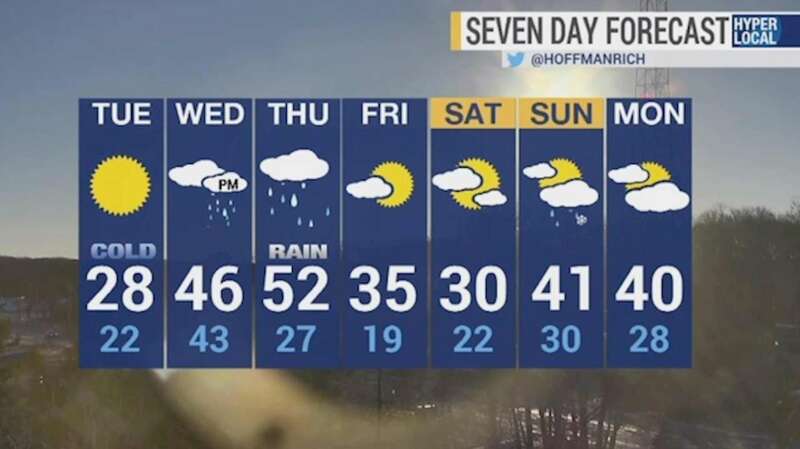 Forecast: Today's cold isn't here to stayThe deep freeze won't last, though, as Tuesday is expected to see temperatures rise to the mid- to upper 20s, with Wednesday looking at the mid-40s. FAA: High winds, cold lead to airport delaysDelays on inbound flights to LaGuardia and Kennedy airports had peaked at up to two ... Think yesterday was cold? In 1984 it was -3 degreesAs we step into January, one third of winter is over, meteorologically speaking. Of course, the worst is possibly yet to come with January holding the coldest month title, historically.